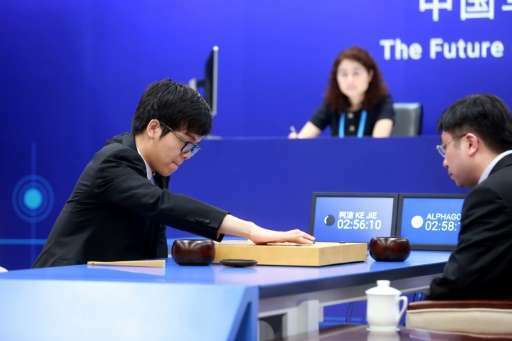 AlphaGo took the first of a scheduled three games against brash 19-year-old Chinese world number one Ke Jie, who after the match annointed the programme as the new "Go god". This week's match-up in the eastern Chinese city of Wuzhen, between Ke and an updated version of AlphaGo, has been highly anticipated amid speculation about whether AI could beat the world's top player. But a visibly flummoxed Ke—who last year had declared he would never lose to an AI opponent—said AlphaGo had become too strong for humans, despite the razor-thin half-point winning margin. "I feel like his game is more and more like the 'Go god'. Really, it is brilliant," he said. Ke vowed never again to subject himself to the "horrible experience" of matching wits with the machine following this week's contests. AlphaGo's feats have fuelled visions of a brave new world of AI that can not only drive cars and operate "smart homes", but potentially help mankind figure out some of the most complex scientific, technical and medical problems. But AlphaGo's success is considered the most significant yet for AI due to the complexity of Go, which has an incomputable number of move options and puts a premium on human-like "intuition", instinct and the ability to learn. Before AlphaGo, mechanical mastery of the game had been perceived to be years away. Its victories have been analysed and praised by students of the game as innovative and even "beautiful", opening up new ways of approaching strategy. After Lee lost to AlphaGo last year, Ke boldly declared "Bring it on!" Ke, a phenom who went pro at age 11 and has described himself as "pretentious", has vacillated between awe and disdain for AlphaGo. He called it a "cold machine" lacking passion for the game in comments Monday night on China's Twitter-like Weibo platform. For some, rapid advances in AI conjure sci-fi images of a "Terminator" future in which machines "wake up" and enslave humanity. "This isn't about man competing with machines, but rather using them as tools to explore and discover new knowledge together," he said before Tuesday's match. "Ultimately, it doesn't matter whether AlphaGo wins or loses... either way, humanity wins." What utter tosh. On every move, as player has at most the same number of possible moves as there are empty points (intersections) on the board. @Nick Gotts : They mean that calculating possible moves increases faster than n^2 for each step. So it is practically impossible to calculate all the possible moves in depth (for a traditional computer). When you are about to make a move, you have relatively few options, but calculating the best one by going through all answers and counteranswers in depth is incomputable.